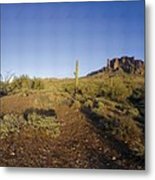 Lost Dutchman Park Supestition Mountains by Brian Lockett - 12.000" x 6.875"
Lost Dutchman Park Supestition Mountains framed print by Brian Lockett. Bring your print to life with hundreds of different frame and mat combinations. Our framed prints are assembled, packaged, and shipped by our expert framing staff and delivered "ready to hang" with pre-attached hanging wire, mounting hooks, and nails. 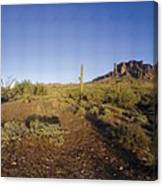 There are no comments for Lost Dutchman Park Supestition Mountains. Click here to post the first comment. 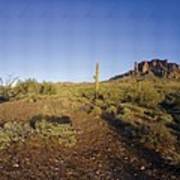 Late afternoon view of the Superstition Mountains from Lost Dutchman Park. This picture was assembled from over 200 frames and has a field of view of about 210 degrees. It is available as prints as large as 48" x 84" at 300 pixels per inch.